To Cite: Rastegar A. Presenting a Causal Model of Predicting Computer Anxiety Based on Intelligence Beliefs: The Mediatory Role of Achievement Goals and Cognitive Engagement, Interdiscip J Virtual Learn Med Sci. 2016 ; 7(3):e12179. doi: 10.5812/ijvlms.12179. Background: Everything related to computer technology is supposed to be important in the present era; however, many people have negative feelings and attitudes toward working with computers. One such feeling is computer anxiety. This study purposed to present a model for predicting computer anxiety based on intelligence beliefs and focusing on achievement goals and cognitive engagement. Methods: This study was descriptive and correlational type. The study population consisted of humanities students of Shiraz Payam Noor University. Using stratified sampling, 290 (194 female and 96 male) undergraduate students of the Faculty of Humanistic Studies, Shiraz Payame Noor University were selected and assigned as the research samples. Participants were asked to complete such questionnaires as the Computer Anxiety Scale, Achievement Goals, and Intelligence Beliefs and Cognitive Engagement. Path analysis using LISREL software version 8.51 was used for data analysis. Results: The results showed that incremental intelligence beliefs had a negative indirect effect on students’ computer anxiety (-0.05), which was statistically significant at a level of 0.01 (P < 0.01). This indirect effect operates through mastery goals and deep cognitive strategies. Meanwhile, the indirect effect of entity intelligence beliefs on computer anxiety equaled 0.01 and was not statistically significant. Moreover, among the variables included in the study, mastery goals had the most indirect effect on computer anxiety; the effect was negative, equal to 0.13, and statistically significant at a level of 0.01 (P < 0.01). Direct cognitive strategies had the most direct effect on computer anxiety in the fitted model at a rate of 0.39, which was statistically significant at a level of 0.01 (P < 0.01). Conclusions: The findings of this research showed that the relationship between intelligence beliefs and computer anxiety is affected by achievement goals and cognitive engagement. Today, information can be rapidly transferred to a wide population because of science and technology. “In this information age, in which a growing amount of information rapidly spreads out, it is necessary that students become active individuals who can reach, organize, process and internalize the constantly-increasing information instead of becoming passive learners in the learning process” (1). Moreover, industrial advancements and changes in the quality of life resulting from such advancements have affected the mental health of people. One such mental effect is computer anxiety, which has been markedly noticed by researchers (1, 2). “The importance of anxiety is underlined by the introduction of the umbrella-concept of academic anxiety, defined as a collection of anxieties lived by the students in the pre-university and university environment, or related to it, such as: math anxiety, science anxiety, and foreign language anxiety” (2). Computer anxiety can be added to this category because of the need, specific to the contemporary age, to effectively use the computer as a learning means (3). Theorists have tried to analyze one of the newest pathologies of the second millennium: computer anxiety. Golamali Lavasani (4) suggests that computer anxiety is a kind of emotional and cognitive reaction that occurs while the individual is working and interacting with a computer; it happens as a consequence of a lack of awareness and the individual’s attitude towards the computer as a threatening object. The computer is a part of today’s everyday life. This reality is more vivid in universities and among university students. Interacting with a computer is an essential and fundamental part of many scientific fields. Therefore, in these circumstances, educational systems should undergo many changes to be effective in the process of developing a society. During the past decade, emphasis on computer technology in everyday life and also on the university campus has been increased. Now, multimedia classes with their associated technologies are commonplace in universities. Increasingly, university students are obliged to deliver their assignments via computer and use hardware and software in their projects (5). According to Osatuyi (6), computer anxiety relates to the uncertainties and risks associated with the increasing proliferation of digital goods and services in the current information age. Meanwhile, open and distance educational systems which claim to be ahead of other areas of science (in this sense) are faced with two fundamental challenges: first, they should convey the necessary information about new information technologies to their learners, and secondly, they should provide such technologies for their learners. Therefore, it can logically be assumed that the use of a computer can cause anxiety and distress among students. This may result in a huge number of students avoiding the utilization of new technologies (especially the computer) in their projects, which can in turn result in their deprivation of the information, speed, and accuracy of modern technologies (4). Utilizing a computer is not always a pleasant and joyful experience for its users. Even worse, some students hate working with computers or are sometimes frightened by this experience. These people are suffering from different degrees of computer anxiety (7). Different conditions make people, especially university students, become familiar with the computer and how to use it properly. Users should not avoid the computer and should not have any fear regarding it. Obviously, reaching these goals needs more cognition, perception, and information about computer anxiety and its mediatory factors. Since 1980 researchers and educational psychologists have relied on cognitive-motivational perspectives which study the cognitive and motivational determinants of a learner’s functions to explain a learner’s behavioral outcome in an educational environment. Dweck’s Theory regarding intelligence beliefs and achievement goals lies within this framework (8). Intelligence beliefs comprise both incremental and entity intelligence belief. Incremental intelligence belief means that intelligence has a flexible, expandable and controllable quality (8-10). Learners who have an incremental intelligence theory most notably concentrate on improving their capabilities and learning new information. These learners strive to overcome their previous frustration and failures (8, 9). Learners with an entity theory about intelligence believe that intelligence has a fixed, inflexible, uncontrollable, and non-expandable quality (8-10). These learners concentrate on performing well and make little endeavor to achieve their goals and overcome their obstacles (8). Dweck and Leggett (9) claimed that intelligence beliefs are subordinate factors of success, which means they cannot directly affect success. According to Dweck and Leggett (9), the concept of goal achievement refers to a learner’s reasons for doing his tasks (11). In other words, learners will ask themselves why they should do a particular job. Dweck and Leggett (9) noticed two types of goals: mastery goals and performance goals. Learners who choose mastery goals concentrate on mastery and obtaining different skills through their tasks. Conversely, learners who choose performance goals try to show their capabilities to others and impel observers to give good evaluations of their work. Some researchers have expanded Dweck’s theory of goals by categorizing them into two dimensions: performance-approach and performance-avoidance goals. They have considered mastery goals, performance-approach goals, and performance-avoidance goals (8). Learners who have performance-approach goals compare their performance with that of others. They consider learning as a means to reaching their goals. Those who use performance-avoidance goals try to make people evaluate their performance positively. Meanwhile, they try to show themselves as more intelligent than others so as to avoid punishment (12). Some research projects have studied the correlation between intelligence beliefs and achievement goals, and some studies have shown a positive and significant relationship between intelligence and mastery goals (8, 9, 13-15). Other studies have indicated that students with entity intelligence beliefs choose performance-approach goals (9, 12, 13, 15, 16). A student’s entity beliefs about intelligence are related to his/her choice of performance-avoidance goals (12-15). 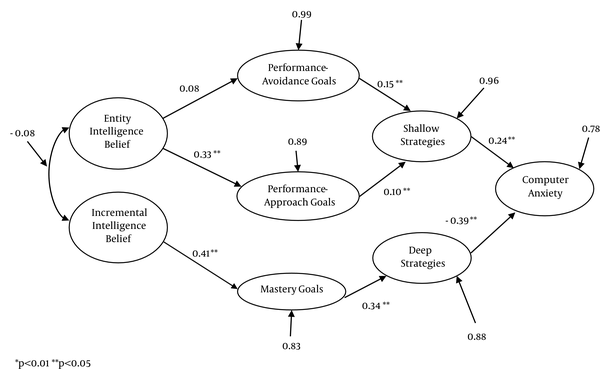 Although some research findings do not proven a positive and significant relationship between mastery goals and entity intelligence beliefs and performance-approach goals, they do, simultaneously, prove a negative relationship between incremental intelligence beliefs and performance-avoidance goals and between entity intelligence beliefs and mastery goals (8). Some researchers have studied the relationship between achievement goals and computer anxiety. For example, Tanaka, Takehara, and Yamauchi (17) have shown that performance-approach goals have a negative correlation with state anxiety, while performance-avoidance goals have a positive relation with it. Among their findings, only the relationship between performance-avoidance goals and state anxiety was significant. Other studies have indicated that mastery goals and performance-avoidance goals have a negative correlation with test anxiety (18-20), while performance-avoidance goals have a positive correlation with it (20). Salili, Chiu, and Lai (21) noted that among Chinese students, learning goals have a positive correlation with test anxiety. Dickson and MacLeod (22) determined that anxiety is correlated to avoidance goals. Lavasani, Weisani, and Ejei (23) demonstrated that performance-approach and performance-avoidance goals affect statistics anxiety through extrinsic motivation and cognitive strategies. In a study on Tehran university students, Ghorban Jahromi (24) found that the relationship between performance-avoidance goals and computer anxiety is positive and the relationship between mastery goals and computer anxiety is negative. In that study, a significant correlation between performance-approach goals and computer anxiety was noted. Clearly, few studies have examined the relationship between achievement goals and computer anxiety. Therefore, to determine those variables which can mediate between achievement goals and computer anxiety, the following discussions will consider cognitive engagement as a result of the adoption of achievement goals by learners. Cognitive engagement refers to all kinds of processing used by students for learning (25) and includes deep and shallow strategies which will be discussed in this article. The research literature indicates an experimental correlation between the adoption of mastery and performance goals and cognitive engagement (26). Cognitive engagement has commonly been conceptualized as deep and shallow learning strategies (27). Deep learning is characterized by strategies such as elaborating ideas, thinking critically, and linking as well as integrating one concept with another (28). In comparison, shallow learning is characterized by such strategies as memorization and reproduction of learning materials (28). Accumulating evidence from the achievement goal literature has established a consistent pattern that indicates a mastery goal would facilitate the use of deep learning strategies (e.g., Elliot and McGregor, 2001; Greene et al., 2004 (26)). The relationship between performance-approach goals and learning strategies is ineffective and therefore indecisive. Some studies (e.g., Elliot and McGregor, 2001, cited in (26)) have confirmed that this goal can only predict the use of shallow learning strategies. In other studies (29), this goal has a relationship with the use of both deep and shallow learning strategies. Others still (30) have not indicated any correlation between performance goals and learning strategies (26). Liem et al. (26) indicated that both mastery and performance-approach goals positively predict deep learning. Mastery goals have a positive relation with shallow learning, and performance-avoidance goals positively predict shallow learning. Rastegar et al. (12) also showed that mastery goals positively predict metacognitive strategies and performance-avoidance and performance-approach goals positively predict cognitive strategies. The results of some studies concerning the relationship between achievement goals and cognitive engagement indicate a positive relation between mastery goals and using deep processing strategies such as metacognitive strategies (8-10, 15, 16, 25, 31). Moreover, research findings indicate that performance-approach goals (8, 15, 16, 25, 32) are positively and significantly related to performance-avoidance goals (15) through cognitive strategies. However, the results of Sins, et al. (33) indicate that performance-approach goal orientation has no significant correlation with the use of shallow strategies. Some researchers have studied the relationship between cognitive engagement and computer anxiety. For example, Naveh-Benjamin (34) indicated that familiarizing learners with the procedure of learning (metacognitive strategies) can be effective in reducing their anxiety. In another study, Tsai and Tsai (35) concluded that learners with a better understanding of the four strategies of information processing, choosing the best ideas, monitoring their understanding, and using original references for their studying had more knowledge and better orientation about computers and less computer anxiety. In other words, there was a strong correlation between using these strategies and computer anxiety, but there was no correlation between shallow strategies (such as memorizing and rehearsal) and computer anxiety. Ward also found that those learners who use advanced strategies in their learning procedure have less computer anxiety than those who use shallow and simple strategies. Moreover, other studies have shown that learner’s strategies play a strong role in reducing computer anxiety (36). Given the abovementioned findings about relationships among variables, the main research goal of the present study was to investigate the mediatory role of achievement goals and cognitive engagement in the relationship between intelligence beliefs and computer anxiety in Payame Noor University undergraduate students within a causal model. A model derived from Dweck’s Social-cognitive perspective and other studies was used as the conceptual model and analyzed by means of path analysis (Figure 1). This descriptive, correlation study was designed to examine the relationships between the studied variables through a causal model. The research population comprised undergraduate students of the Humanistic Studies Department of Shiraz Payame Noor University in the academic year 2013 - 2014. The research sample included 290 (194 female and 96 male) students selected by means of ratio stratified sampling. This method of sampling was chosen because of the heterogeneity of the population based on the gender variable. Data was collected through the 32-item computer anxiety scale by Beckers and Schmidt (7), the 12-item achievement goals questionnaire by Middleton and Midgley (37), the 9-item intelligence beliefs by (8) Dupeyrat and Marine, and the cognitive engagement subscale from the MSLQ questionnaire by Pintrich et al. (38) including 22 items. To determine the reliability coefficient of the subscales, Cronbach’s alpha (α) was used. The reliability coefficients for entity intelligence beliefs, incremental intelligence beliefs, computer anxiety, mastery goals, performance-approach goals, performance-avoidance goals, shallow and deep cognitive engagement were 0.80, 0.78, 0.70, 0.78, 0.78, 0.70, 0.69, and 0.70, respectively, all of which indicate the good reliability of the tools. Confirmatory factor analysis was used to determine the structure validity of variables, and the fit indices of this analysis are displayed in Table 1. Several indices were used to assess the overall fit of the model: the goodness-of fit index (GFI), adjusted goodness-of-fit index (AGFI), and root mean square error of approximation (RMSEA). Generally speaking, GFI and AGFI values above 0.90 and RMSEA values less than 0.06 are indicative of an optimal model fit. RMSEA values at or above 1.0 reflect a poor fitting model. Values of v2/df that fall below 5.00 and CFI above 0.90 are indicative of a good fit. Table 1 shows that the data has a good fit with factorial and fundamental constructs of intelligence beliefs, achievement goals, cognitive engagement, and computer anxiety, indicating that the questions are consistent with theoretical constructs. Data was analyzed using some descriptive indices (mean, standard deviation, skewness, and kurtosis), Pearson correlation coefficient, and path analysis with LISREL. The causal correlations among the research variables were investigated using path analysis. Intelligence beliefs were considered as exogenous variables, while achievement goals, cognitive engagement, and computer anxiety were considered as endogenous variables. Table 2 shows the statistical indices of the research sample. Skewness and kurtosis statistics indicate that data distribution for each variable was normal. Also according to the data in Table 2, the significance level for Kolmogorov-Smirnov test for all variables is higher than 0.05, which represents a normal distribution of variables. Since a correlation matrix is the basis of causal model analysis, Table 3 presents the correlation matrix of the variables under study along with the correlation coefficients and their significance levels. According to Table 3, deep strategies (0.41), shallow strategies (0.28), performance-avoidance goals (0.13), mastery goals (0.10), incremental intelligence beliefs (0.08), entity intelligence beliefs (0.02), and performance-approach goals (-0.005) had the highest to lowest correlation coefficients with computer anxiety, respectively, the first three being statistically significant (P < 0.01). Since the research goal was to study the mediatory role of achievement goals and cognitive engagement in the relationship between intelligence beliefs and computer anxiety, Table 4 presents the direct, indirect, and total effect coefficients of variables with their significance levels. As can be seen in Table 4, none of the exogenous variables (entity intelligence beliefs and incremental intelligence beliefs) has a direct effect on computer anxiety; however, they do have indirect effects. In fact, achievement goals and cognitive engagement have mediatory roles between intelligence beliefs and computer anxiety. The indirect effect of incremental intelligence beliefs (-0.05) is significant at 0.01 and is presented via performance-approach goals, performance-avoidance goals, and shallow strategies. The indirect effect of entity intelligence beliefs on computer anxiety (-0.01) has not reached a significant level. Moreover, the indirect effect of mastery goals on computer anxiety (-0.13) is significant at 0.01 and is presented through deep strategies. The indirect effect of performance-approach goals on computer anxiety (0.03) is not significant, but the indirect effect of performance-avoidance goals on computer anxiety (0.04) is significant at 0.05 and is presented through shallow strategies. Among the endogenous variables, only shallow and deep strategies directly affect computer anxiety, with deep strategies have the greatest effect (-0.39). It is noteworthy that mastery goals have the highest indirect effects on computer anxiety. Moreover, the amount of explained variance of computer anxiety in the fitted model is 22%. Given the fit indices presented in Table 5, the fitness of the computer anxiety predicting model is relatively good. This research studied the mediatory role of achievement goals and cognitive engagement in the relationship between intelligence beliefs and computer anxiety. Therefore, based on Dweck’s social-cognitive theory and research literature, a conceptual model was proposed and then analyzed by means of path analysis. The results showed that the proposed model has a good fitness with research data and predicts 22% of computer anxiety variance. Among exogenous variables, deep strategies had the greatest direct effect on computer anxiety. This finding proves the hidden value and effectiveness of these strategies for students. It is noteworthy that the importance and positive effect of these strategies have been proven in many psychological studies. Also among the endogenous variables, mastery goals had the greatest indirect effect on computer anxiety through deep strategies. The fact that entity intelligence beliefs has a significant and positive effect on performance-approach goals indicates that students who think intelligence has a fixed quality focus on attaining high scores, being better than others, and gaining rewards; moreover, they choose performance-approach goals. These findings are in line with those of Dweck and Legget (9), Vermetten et al. (16), and Braten and Sromso (11). The results also indicate the correlation between entity intelligence beliefs and performance-avoidance goals is not significant. In other words, entity intelligence beliefs cannot predict performance-avoidance goals. This finding is in line with those of Dupeyrat and Marine (8); however, it is not congruent with the findings of Zare et al. (13). Those who choose performance-avoidance goals try to gain positive judgments from others and show themselves as good people in order to avoid punishments (39). In fact, they tend to have no lack of skill compared with their peers and classmates, because they concentrate on avoiding failure. The fact that incremental intelligence belief has a significant direct and positive effect on mastery goals indicates that students who think intelligence has a flexible and ascending quality focus on hard work, accept mistakes as a factor of learning, and perfect understanding and gaining new skills while they choose mastery goals. This finding is in line with those of Dweck and Legget (9), Vermetten et al. (16), Braten and Stromso (11), and Zare et al. (13). The findings also indicate that performance-avoidance goals have a positive, direct, and significant effect on shallow strategies. This finding is congruent with those of Rastegar et al. (12), Elliot et al. (30), and Elliot and McGregor (35), yet is not in line with those of Sins et al. (36). Overall, the abovementioned findings indicate that students who tend toward avoiding a lack of skill and failure in regard to their peers and classmates use shallow strategies to reach their goals, and the findings show the correlation between performance-approach goals and shallow strategies is not significant. Students who have approach-performance goals concentrate on comparing their performance with that of others and consider learning as a means to reach their goals. Such a person seeks achievement so as to show his/her abilities to others and thereby gain their approval. This perception of performance arouses emotions which can motivate an individual to work harder and increase his concentration on his/her homework. This finding is in line with those of Middleton and Midgley (40) and Elliot and McGregor (35), but it is not congruent with those of Rastegar et al. (12), Elliot, McGregor, and Gable (30), Elliot and McGregor (35), or Dupeyrat and Marine (8). In fact, it has been proven that the correlation between performance-approach goals and cognitive processing of learned data by students is paradoxical. Given this paradox, Midgley, Kaplan, and Middleton (40) believe that performance-approach goals are affected by the nature of learned materials, individual characteristics, and environmental conditions. Therefore, this paradox can be the result of using different instruments, age groups, and educational environments. For example, succeeding at university may require more endeavor and hard work than succeeding at a secondary school. Students who adopt performance-approach goals make more use of shallow cognitive strategies to reach their goals. Moreover, the results show that mastery goals have direct, positive and significant effect on deep strategies. This finding is congruent with those of Dweck and Legget (9), Elliot, McGregor, and Gable (30), Elliot and McGregor (35), Vermetten et al. (16), Dupeyrat and Marine (8), and Rastegar et al. (12). Generally, the abovementioned findings indicate that students who seek mastery goals are interested in their homework and consider it to be important and functional. These students work endlessly and use deep strategies. Additionally, the results indicate that deep strategies have a direct, negative, and significant effect on computer anxiety. This finding is congruent with those of Tsai and Tsai (38) and Naveh-Benjamin (37). Therefore, it can be concluded that students who use deep strategies, like lesson planning, control, monitoring and organizing, in their leaning process are likely to have less computer anxiety. Ultimately, the fact that shallow strategies have a direct and positive effect on computer anxiety indicates that students who use strategies like memorizing, rehearsal, summarizing, explaining and such have higher levels of computer anxiety. This finding is in agreement with those of Tsai and Tsai (38). The findings show that the construct of shallow strategies has a positive and significant effect on computer anxiety, which proves that these strategies have more dysfunctional outcomes than deep strategies. Given these findings about deep strategies and their roles in decreasing student’s computer anxiety, lesson planners should identify those variables which can motivate students to use deep strategies. Sins et al. (36) believe that achievement goal theorists suppose that students who have higher levels of mastery goals try to gain a deep insight into learning. means that these students are more engaged in deep cognitive processes so as to increase their understanding (18). Thus, it is suggested that more interesting, usable, and beneficial tasks be provided to students., while educational authorities adapt their teaching methods to student strategies, they are recommended to increase student’s insight into deep strategies and motivate them to engage more cognitively and actively in their learning processes. Given the findings, it can also be concluded that, in classes which have fewer students and continuous evaluation, students organize their learning process so that they tend to choose mastery goals. According to Meece, Blumenfeld, and Hoyl (18), other class-related characteristics also direct students toward mastery goals, such as diversity of homework, challenging homework, and the quality of assignments given them which should inspire the feeling that doing homework can help improve learning. According to Elliot and Dweck (41), students will seek performance goals if the criteria of schools and other educational institutions are normative. Conversely, if the criteria of these institutes are criterion-oriented accompanied by concentration on skills, students will pursue mastery goals and try to expand their learning and skills. If such an orientation as “university increases students’ social responsibility and understanding of the world” could be internalized, thereafter, students’ motivation for learning would be increased and they would be more responsible for their learning. Moreover, given the indirect and negative effect of incremental intelligence beliefs on computer anxiety, it can be concluded that students who think that intelligence has a flexible and expandable quality adopt mastery goals and use deep strategies to reach their goals. Thus, these students are likely to experience less computer anxiety. Since the variables in this study could only predict 22% of computer anxiety variance, further research into other motivational variables and in this domain is highly recommended. The author thanks all those students in the faculty of humanistic studies from Shiraz Payame Noor University who contributed to this research. 5. Implications of instituting laptop requirements for students in business programs. Annual DSI Meeting.